But there could be another interpretation to the first paragraph. 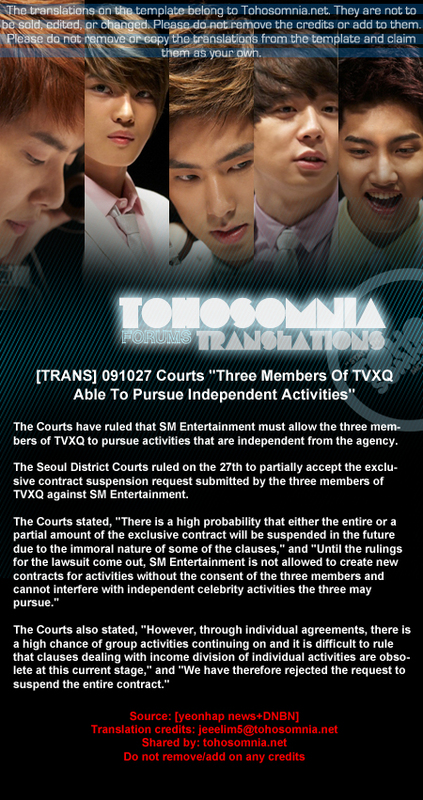 I think the statement “…applies to the other two members as well…” may also mean that the ruling itself doesn’t apply to HoMin but they are AFFECTED by it since it will have an effect on the activities of DBSK. Get what I mean? It could mean that way, I think… I hope someone could clear that up since I was pretty sure that the ruling of the Court ONLY applies to JaeChunSu since they’re the only ones who asked for the suspension of the exclusive contract. Anyway, I don’t know if it’s proper for me to wish that the other two members will get involved in this lawsuit against SM, too. Seeing the partial result of the lawsuit by JaeChuSu, I couldn’t help but hope that HoMin will be as free as the other three members and there’s no other way to do that but to get involved in this. Also as a fan, I think that’s the best way that we can be guaranteed that all of them will be doing activities together whether or not they stay with SM. Hero Jaejoong, Micky Yuchun and Xiah Junsu, the three members of TVXQ briefly shared their opinion about the court’s decision of the provisional disposition application, and the declaration to stop the exclusive contract caused by SM Entertainment. The legal affairs corporate “世宗: Sejon” which has been taking charge of this lawsuit of the three described in an official press release on October 27th, 2009. I’m glad that somehow the court’s decision has made the three members happy although I know that this definitely is not enough. But what caught my attention in the statement of their lawyer is the fact that SM DID ARE NOT PAYING THEM SINCE FEBRUARY THIS YEAR. SM is such a monster! How could the company do that to them?! Crazy and pathetic. 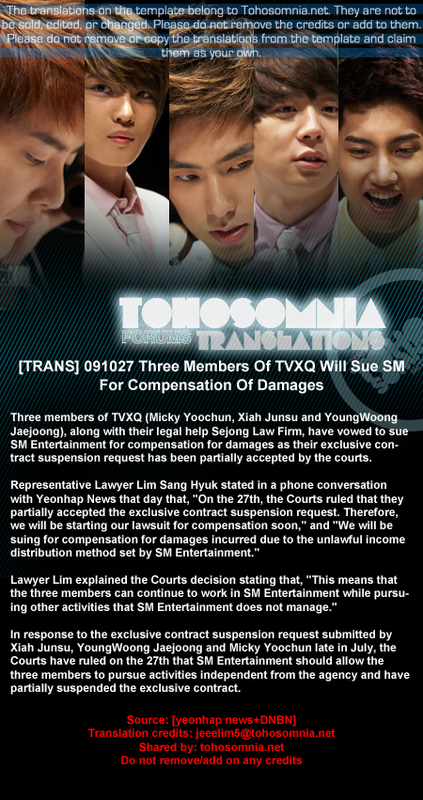 Now, I believe that the members really have the right to sue for damages. It doesn’t matter if this will be another lawsuit considering the former is still not yet fully resolved because they most certainly have the right to claim compensation for damages. In relation to Court approving partially of 3 TVXQ members’ lawsuit to terminate exclusive contract effect, SM Entertainment released their official press release today. And I have only one thing to say: WHATEVER. Period. 1. The Courts has released a ruling last October 27th regarding the lawsuit between JaeJoong, Yoochun & Junsu of TVXQ and SM Entertainment. The Courts has PARTIALLY approved the suspension of the exclusive contract of the three members under SM Entertainment. 2. The Courts only SUSPENDED the contract but the contract itself is still valid. Only the exclusivity clause has been suspended but the rest of the contents of the contract (income distribution, long term of the contract, etc.) is still under the evaluation of the Courts. 3. Suspension of the exclusive contract means the three members JaeJoong, Yoochun and Junsu can freely do independent activities from now on. Independent activities refer to activities that are not organized and/or has no connection or interference whatsoever from SM Entertainment. They don’t have to ask permission from SM to do activities that they wish to pursue such as investing on business, etc. 4. Also, the members CAN FREELY REFUSE to do activities that SM wants them to do if they deem these activities as something burdensome on their part. SM can no longer force them to do so many activities if they do not wish to do it. This means the three members have more control on the amount of work they receive from SM from now on. 5. JaeJoong, Yoochun and Junsu are STILL UNDER SM Entertainment. The other parts of their contract with the agency is still valid so they CANNOT leave SM, unless the Courts will allow them in the future. 6. The issue on the long term of the contract and the income distribution is still under scrutiny of the Courts so that means that the three members’ contract term is still 13 years and the income distribution stays the same, for now. 7. 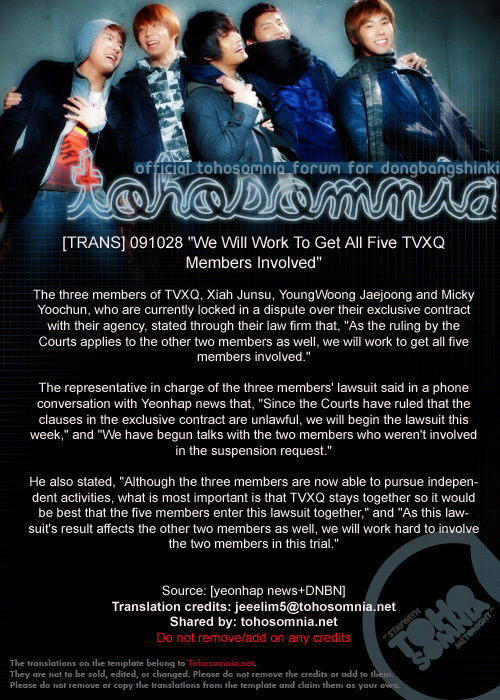 The suspension of the exclusive contract only applies to the three members JaeJoong, Yoochun and Junsu and NOT for all the members of DBSK. This means that Yunho and Changmin do not have the same “freedom” granted to the other three members. 8. The three members accepted the partial ruling by the Courts and are getting ready to sue SM for compensation of damages. 9. This lawsuit is not over yet since the Courts still has to evaluate the other parts of the contract and come up with a ruling on those issues, too. There you go. I hope it’s much clearer for you now in case you got confused in reading the articles. I repeat that this is the way I understand the Court ruling so forgive me if I understood it differently. Anyway, like what I have said, this is not over yet but at least this is a good development on this whole ordeal. At least now they have more freedom although they are not completely out of SM. I’m happy for JaeJoong, Yoochun and Junsu and I hope that the rulings of the Courts on the other issues on the contract that they raised will also have a favorable result to them. By the way, thanks to nakey1000 for telling me that news about the lawsuit is out and for Tohosmonia for the fast translations! JaeChunSu will file another case against SM and this time, it’s for “Compensation of Damages”.